With a win against the Philadelphia Phillies on Monday, the New York Mets jumped into first place in a competitive NL East. One inning into their next game against the Phillies, the Mets were probably well aware they weren’t staying there. 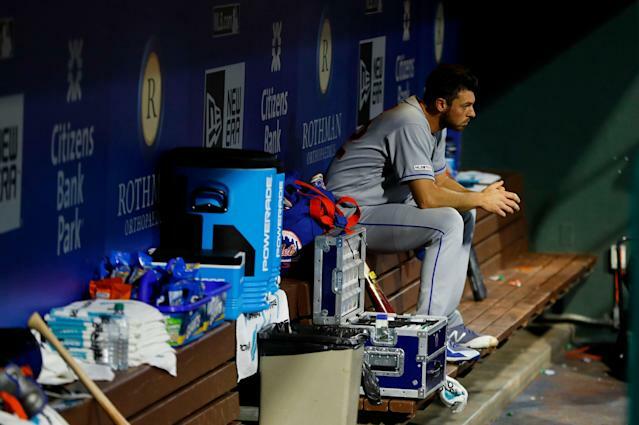 Mets starter Steven Matz had the mother of all bad starts on Tuesday when he allowed eight runs (six earned) and four extra-base hits against a division rival. While those numbers would be bad over any number of innings, Matz did it all without recording an out. To be fair, Matz obviously didn’t get much help from shortstop Amed Rosario, whose two errors converted two outs into eventual runs. Even though it wasn’t all Matz’ fault, Mets manager Mickey Callaway mercifully pulled his starter for reliever Drew Gagnon after allowing his second three-run homer. Matz entered the game with a 1.65 ERA. When he exited the game, it had reached 4.96. At the very least, Phillies fans gave him a standing ovation. Gagnon would soon right the ship, in the sense that allowing two runs (zero earned) and getting three outs was a major improvement on his predecessor. In total, the Mets defense faced 14 batters and allowed 10 runs, five extra-base hits, four errors, two walks and a hit-by-pitch. As if that wasn’t enough, injury was literally added to insult when Mets center fielder and leadoff man Brandon Nimmo exited with an apparent injury. On the bright side, Mets catcher Wilson Ramos led off the second inning with a solo home run. As you could probably guess, innings like this don’t happen every day, or even every season. And the 10 runs allowed are the most in any inning for the Mets since 2012, when they surrendered 11 at Colorado. They made four errors in that inning as well. With the game all but over headed into the second inning, the Mets’ Twitter account could only sit back and shrug its shoulders.